This book explains satellite position location technology and how the GPS system has evolved. You will learn the functional parts of GPS systems and how they work together to provide position measurements that are accurate to within centimeters. The operation of GPS is described including satellite acquisition, signal reception and pseudo-ranging. Discover how time reference and error correction data is used and why it is very important to provide precise satellite positioning. Global positioning system is a navigation system that uses satellites to act as reference points for the calculation of position location. You will learn how GPS devices can use other systems or devices to provide location services when there is a temporary loss of a satellite links. Explained are the multiple types of civilian and military codes used in the GPS system and how they provide different levels of accuracy and reliability. GPS radio technology is described including the frequencies GPS uses, modulation and power levels. You will learn about the many applications that use GPS technology including mapping, location monitoring, agriculture control, navigation, navigation warfare (NAVWAR), surveying and structural deformation monitoring. Learn how GPS is used in combination with other position detection systems such as laser ranging to provide 3 dimensional charts and maps. The sources of GPS errors are explained such as orbital position errors and variation in radio propagation. You will learn ways to minimize the errors such as receiver initialization, RTK and differential GPS (D-GPS). A brief description if the interface and data format standards is provided. This figure shows a global positioning satellite (GPS) system. This diagram shows how a GPS receiver receives and compares the signals from orbiting GPS satellites to determine its geographic position. Using the precise timing signal based on a very accurate clock, the GPS receiver compares these signals from 3 or 4 satellites. Each satellite transmits its exact location along with a timed reference signal. 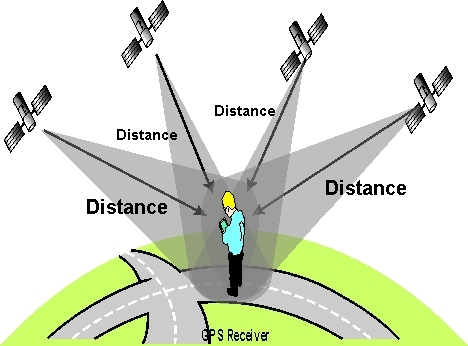 The GPS receiver can use these signals to determine its distance from each of the satellites. Once the position and distance of each satellite is known, the GPS receiver can calculate the position where all these distances cross at the same point. This is the location. This information can be displayed in latitude and longitude form or a computer device can use this information to display the position on a map on a computer display. 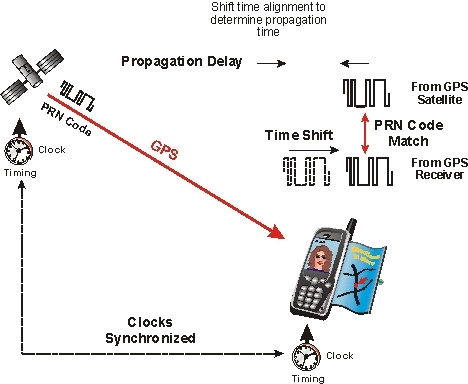 This figure shows how propagation time from a satellite is calculated in a GPS system. This diagram shows that a GPS satellite sends a unique coded message at a specific time. The GPS receiver continuously looks for the unique satellite code and when it matches, it notes the time difference between when the message was sent compared to its internal clock of the GPS receiver. This difference of time is the propagation time. 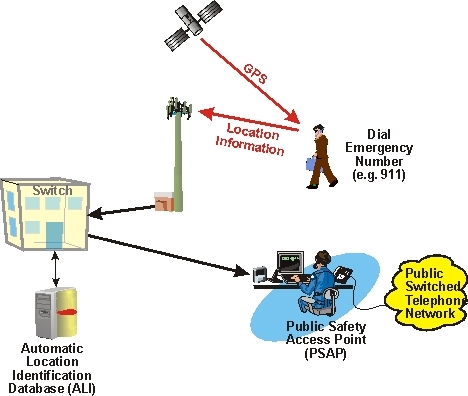 This figure shows how mobile communication systems can be enhanced through the use of GPS technology to provide for emergency location services. This example shows that a mobile telephone has both mobile communication and GPS reception capability. When the user needs emergency assistance, the GPS information can be sent to the public safety access point to allow the direction of emergency services to the location where the user's mobile telephone is located. Mr. Harte is the president of Althos, an expert information provider covering the communications industry. He has over 29 years of technology analysis, development, implementation, and business management experience. Mr. Harte has worked for leading companies including Ericsson/General Electric, Audiovox/Toshiba and Westinghouse and has consulted for hundreds of other companies. Mr. Harte continually researches, analyzes, and tests new communication technologies, applications, and services. He has authored over 80 books on telecommunications technologies on topics including Wireless Mobile, Data Communications, VoIP, Broadband, Prepaid Services, and Communications Billing. Mr. Harte holds many degrees and certificates including an Executive MBA from Wake Forest University (1995) and a BSET from the University of the State of New York, (1990). Mr. Harte can be contacted at LHarte@Althos.com. Mr. Ben Levitan is an engineer and an expert on new and developing wireless standards for Satellite, Cellular and land mobile radio (LMR) Systems including ANSI-41, GSM, and 3rd Generation systems. Mr. Levitan is an active participant for the US and international development of ANSI-41, GSM, 802.11, All-IP (3G Standards), Interstandard Roaming and FCC and US Government mandated features and requirements. Mr. Levitan has represented COMSAT, Intelsat and Aeronautical Radio, Inc. in the development of satellite standards and was a member of the United States Delegations to the United Nation's International Telecommunications Union conferences for worldwide standardization of telecommunications for eight years. Mr. Levitan has consulted and is an expert witness for several major wireless companies. Mr. Levitan's expertise includes international roaming for cellular systems and government and FCC mandated features such as the new required Wiretap standards (CALEA), Local Number Portability and 911 emergency standards for the cellular industry. Mr. Levitan is a frequent speaker at wireless industry forums and conferences. GPS Quick Course 2nd Edition, Systems, Technology and Operation, ISBN # 1-932813-30-6 is 116 pages, 7.5 x 9.25� soft cover book containing 24 easy to understand diagrams and illustrations. The book is the part of the �Wireless Communication� series produced by Althos Publishing. Other books in the series include Introduction to Bluetooth, Introduction to Mobile Telephone Systems, and Introduction to Mobile Data. These books and many other books covering the communication industry can be obtained from Althos, 106 West Vance Street, Fuquay-Varina, NC 27526 USA, phone 1-919-557-2260 and email info@Althos.com.